Outdoor grilling is one of the best things about warm weather. Before you slap on the steaks, make sure the grill is ready to go. Here are five easy steps to make outdoor cooking a breeze. 1. Keep the grill at least 10 feet away from your house. Whether you use charcoal or gas, maintain a safe distance from any portion of your home that is flammable. Also avoid overhangs, awnings, pergolas, or other patio covering. Don’t grill inside a garage or under a carport, even if it’s raining. If you have vinyl siding, placing the grill too close to the house can permanently damage your siding and lead to costly repairs. If your home is painted, it can cause blistering and chipped paint. 2. Keep the grill clean. The grill should be cleaned after every use for health and safety reasons. 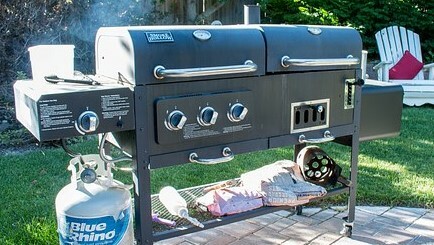 The most important reason to keep the grill clean is to prevent grease fires or flare ups. Stuck on food attracts insects, which isn’t sanitary. Keep pets away from a grill, whether it’s on or off. Dogs especially may be attracted by dripping grease or morsels of food that drop around the grill. 3. Check for gas leaks. Maintain hoses to keep them from cracking and leaking gas. Be sure to check around the top of the propane container as well as the hose. Mix up a solution of dish soap and water and spread it on the fittings and hoses, then turn on the gas. If you see bubbles, fix the problem before you start using the grill. 4. Keep the area around the grill clear of overhanging branches, flower baskets or planters, and decorations. Anything hanging over or around a grill is a fire hazard. 5. Keep a fire extinguisher and spray bottle of water handy. It never hurts to plan. Use the spray bottle to put out any small flare ups. Make sure you know how to use the fire extinguisher BEFORE there’s a fire. It won’t help if you have to stop and read the directions while your house goes up in flames. University Painters provide quality services to keep the interior and exterior of your home looking its best. Call us today for a free estimate or to learn more about our services. Have a safe and happy summer!